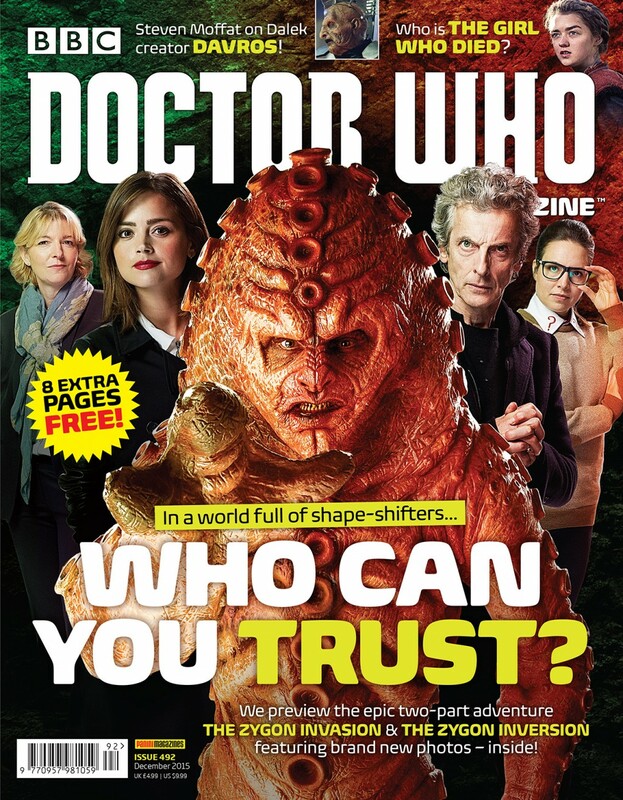 DOCTOR WHO MAGAZINE PREVIEWS THEIR RETURN IN ISSUE 492! DWM looks ahead to the brand new episodes The Girl Who Died and The Woman Who Lived and talks exclusively with writers Jamie Mathieson and Catherine Tregenna. DWM goes behind the scenes of The Magician’s Apprentice and The Witch’s Familiar to discover how the planet Skaro was resurrected, with insights from Dalek voice actor Nicholas Briggs and writer Steven Moffat. In an extensive interview, writer Toby Whithouse talks in-depth about his recent episodes Under the Lake and Before the Flood. Excited by the new series, Jacqueline Rayner reflects on The Magician’s Apprentice and celebrates the magic of Doctor Who in her column, Relative Dimensions. Prosthetic effects supervisor Kate Walshe of Millennium FX talks exclusively to DWM about her team’s creations for the latest series, including Davros, Colony Sarff and the Fisher King! DWM talks to Eighth Doctor Paul McGann about his biggest Doctor Who adventure to date: Doom Coalition! The Fact of Fiction explores the second half of The War Games, the landmark Second Doctor story which introduced the Time Lords. There’s comic strip action in a terrifying new adventure for the Doctor and Clara: The Highgate Horror, by Mark Wright, illustrated by David A Roach and James Offredi. DWM reviews the first four episodes of the latest series: The Magician’s Apprentice & The Witch’s Familiar and Under the Lake & Before the Flood. Plus the latest books and audios are put under the spotlight. All the latest Doctor Who merchandise releases, including – at last! – the DVD release of 1967′s The Underwater Menace. PLUS! All the latest official news, competitions, Wotcha! and The DWM Crossword. Doctor Who Magazine 492 is on sale from Thursday 15 October 2015, price £4.99 – with eight more pages than usual, for no extra cost!